#1 New York Times bestselling author Susan Wiggs returns to sun-drenched Bella Vista, where the land's bounty yields a rich harvest…and family secrets that have long been buried.Isabel Johansen, a celebrated chef who grew up in the sleepy Sonoma town of Archangel, is transforming her childhood home into a destination cooking school—a unique place for other dreamers to come and learn the culinary arts. Bella Vista's rambling mission-style hacienda, with its working apple orchards, bountiful gardens and beehives, is the idyllic venue for Isabel's project…and the perfect place for her to forget the past.But Isabel's carefully ordered plans begin to go awry when swaggering, war-torn journalist Cormac O'Neill arrives to dig up old history. 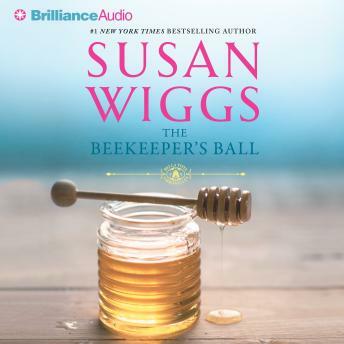 He's always been better at exposing the lives of others than showing his own closely guarded heart, but the pleasures of small-town life and the searing sensuality of Isabel's kitchen coax him into revealing a few truths of his own.The dreamy sweetness of summer is the perfect time of year for a grand family wedding and the enchanting Beekeeper's Ball, bringing emotions to a head in a story where the past and present collide to create an unexpected new future.From 'one of the best observers of stories of the heart' (Salem Statesman-Journal), The Beekeeper's Ball is an exquisite and richly imagined novel of the secrets that keep us from finding our way, the ties binding us to family and home, and the indelible imprint love can make on the human heart. This is not an ordinary love story. It has substance to it!!! Well worth listening to.